The Munna Bhai series saw actors Sanjay Dutt and Arshad Warsi display an excellent camaraderie as the duo shared everything a friendship could offer…..well now they will be seen not as friends, but foes… chasing each other, or rather Sanjay chasing Arshad as cop after alleged criminal!! 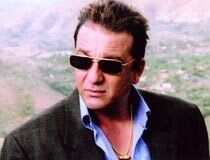 In Indra Kumar's Dhamaal, Sanjay Dutt plays a dashing cop who is after the life of four lovable and foolish idiots (Arshad, Aashish, Ritesh and Javed) who find themselves in an uncanny situation, one after the other. Says Arshad laughingly, "Yes, Munnabhai is out to finish me off in the film!! Sanjay is this very determined cop, who wants to make our life pure hell! Jokes apart it is a very fun filled film and people will see quite a different side to mine and Sanjay's chemistry in Dhamaal!" Well, now that's something we must watch out for as Dhamaal releases 7th September! I don't mind if my 'Dhokha' role offended some: Anupam Kher Aashish Chowdhury 'pools' in his pals!